SilverDoctors: Watch Bernanke's Final Propaganda Lecture LIVE! 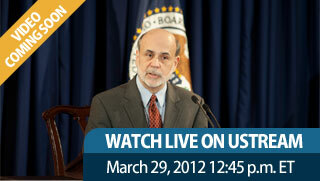 Watch Bernanke's Final Propaganda Lecture LIVE! After dissing gold and the gold standard in his first propaganda lecture to the George Washington University School of Business, discussing the housing bubble in his 2nd lecture, and informing America's youth on how he and The Fed saved the day during the 2008 financial panic for his 3rd lecture, The Bernank is back with the 4th and final tour of his propaganda lecture campaign.